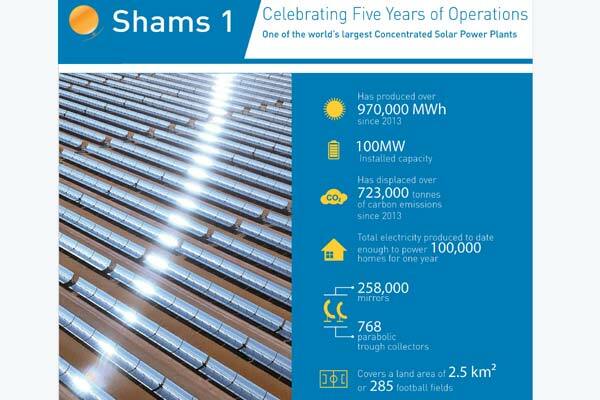 Shams Power Company, the developer, owner and operator of the UAE’s first large-scale solar power project, Shams 1, is celebrating five years of uninterrupted electricity generation at the plant this month. Located in Al Dhafra, Abu Dhabi’s western region, the 100 megawatt-capacity (MW) Shams 1 was the largest concentrated solar power plant in the world at the time of its inauguration in 2013 and the first plant of its kind in the Middle East and North Africa. It also represented the world’s largest financing transaction for a solar energy project. Masdar, Abu Dhabi Future Energy Company, has an 80 per cent stake in Shams Power, while Total, the world’s fourth-ranked international oil and gas company, owns 20 per cent. Shams 1 uses 258,000 parabolic trough mirrors spread over 2.5 sq km to power an electricity turbine with the heat of the sun. To date, the project has achieved a net production of 972,352.33 megawatt-hours (Mwh), enough electricity to power nearly 110,000 homes for one year while displacing more than 720,000 tonnes of carbon dioxide. That is the equivalent of saving more than 360 million kilos of coal. Shams 1 employs around 100 staff with UAE nationals occupying 60 per cent of management positions. Moreover, the project has attracted contractors and service providers to the region that are supporting the wider development of solar thermal technology. Further demonstrating the operational efficiency of large-scale solar power, Shams 1 has also achieved 11 million man hours without a lost-time incident (LTI) to date. The total power capacity of the renewable energy projects around the world in which Masdar is an investor is nearly 3 gigawatts (GW). Other solar thermal power plants in Masdar’s portfolio include Gemasolar near Seville in Spain, the world’s first utility-scale solar power plant to generate electricity 24 hours a day by combining a central tower receiver system with molten salt storage technology.